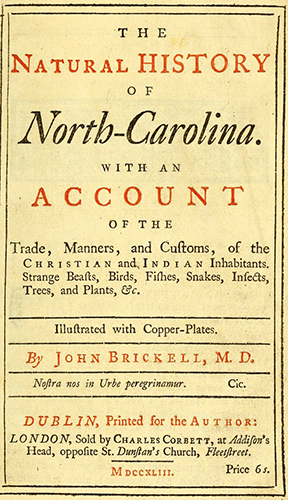 First published in Dublin in 1737, John Brickell's Natural History of North-Carolina was ostensibly written from firsthand observations made by Brickell during his sojourn in North Carolina. The 408-page book contains abundant information on the flora, fauna, history, medical practices, and human cultures of the region, and many scholars have relied on it as an important primary source for the colonial period in North Carolina. As early as 1826, however, historians were warned that much of the content of Brickell's Natural History was a bold plagiarism, in which Brickell used a first-person account to relate observations and events taken from other publications. The most important source of plagiarized material was John Lawson's A New Voyage to Carolina (1709), initially printed in London as part of John Stevens's A New Collection of Voyages and Travels. A New Voyage provided an estimated 85 percent of the text for Brickell's Natural History; not only was the organization of the Natural History copied from Lawson, but whole sections of text were lifted out of A New Voyage and transposed, often verbatim, into Brickell's work. Additional important sources included John Clayton's "Letters" to the Royal Society of London, which appeared in the Philosophical Transactions in 1693-94; Thomas Harriot's A Briefe and True Report of the New Found Land of Virginia (1588); and John Ray's Ornithology of Francis Willughby, produced by the Royal Society in 1678. Brickell also borrowed from multiple sources for the copperplate illustrations of animals and plants that graced his book as well as for the state map, the latter being a version of Edward Moseley's "A New and Correct Map of the Province of North Carolina" (1733). Most of the bird and fish plates were taken from John Ray's Ornithology of Francis Willughby and Historia Piscium, respectively, while many other animal plates were borrowed from Edward Topsell's The Historie of Foure-footed Beasts and The Historie of Serpents. Plant illustrations were derived from John Gerard's Herball and Nicholás Monardes's Primera y Segunda y Tercera. Although Brickell's plagiarisms have been extensively delineated, few substantiated details have emerged about his life. His family background, dates and places of birth and death, and circumstances of his medical training remain unknown. Brickell apparently lived in North Carolina at least from 1729 to 1731, served as physician to Governor Richard Everard, was a member of the North Carolina Grand Jury, and testified before a committee of the Irish House of Commons in 1735-36 after his return to Ireland. Marcus B. Simpson Jr., "Copperplate Illustrations in Dr. John Brickell's Natural History of North-Carolina (1737): Sources for the Provincial Map, Flora, and Fauna," NCHR 62 (April 1985). Simpson, "Dr. John Brickell's Catalogue of American Trees and Shrubs (1739): A Bibliographic Misadventure," Archives of Natural History 21 (1994). Brickell, John. The Natural History of North-Carolina, With an Account of the Trade, Manners, and Customs, of the Christian and Indian Inhabitants, Strange Beasts, Birds, Fishes, Snakes, Insects, Trees, and Plants, &c. Dublin. 1743. http://archive.org/stream/naturalhistoryof02bric#page/n3/mode/2up (accessed August 20, 2012). Weiss, Harry B. "More about Doctor Brickell's 'Natural History of North Carolina'." Journal of the New York Entomological Society 38. No. 3. September 1930. p. 313-315. http://www.jstor.org/stable/25004374 (accessed August 20, 2012). Parramore, Thomas C. "Preface to Natural History of North Carolina." The Colonial Records Project, Historical Publications Section, North Carolina Office of Archives & History. http://www.ncpublications.com/colonial/Bookshelf/Natural/brickpref.htm (accessed August 20, 2012). Adams, Percy G. "John Lawson's alter-ego --Dr. John Brickell," North Carolina Historical Review 34. 1957. Title page of The Natural History of North-Carolina. Brickell, John. The Natural History of North-Carolina, With an Account of the Trade, Manners, and Customs, of the Christian and Indian Inhabitants, Strange Beasts, Birds, Fishes, Snakes, Insects, Trees, and Plants, &c. Dublin. 1743. http://archive.org/stream/naturalhistoryof02bric#page/n3/mode/2up (accessed August 20, 2012). 1 January 2006 | Simpson, Marcus B., Jr.